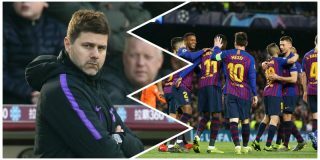 Tottenham Hotspur manager Mauricio Pochettino claims Barcelona will have the edge in their Champions League quarter-final against Manchester United and has backed the La Liga giants to lift the European Cup for a sixth time. United’s season took a turn for the best in December when José Mourinho was sacked and replaced by Ole Gunnar Solskjaer as caretaker manager, though he is now in line to get the job on a permanent basis after guiding the team to 14 wins in 19 games. However, Pochettino, who is also linked with the United job, feels the Reds still have a lot of work to do to compete with Barcelona, with the Catalans currently 10 points clear at the top of La Liga. “If there is one favourite team to win Champions League it is Barcelona,” Pochettino told reporters, as per Sky Sports. The former Espanyol boss has more things on the mind than United vs Barcelona, with Tottenham facing domestic rivals Manchester City in the quarter-finals. “It is clear that Manchester City are a team designed to win and with an obligation to win,” the Spurs manager added.